CD review: "The Cowboys of Baja Have Stolen My Heart"
Not since Judy Collins has there been a country/folk singer with such a pure tone. 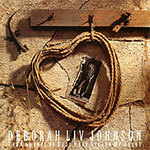 And San Diego's Deborah Liv Johnson combines that beautiful soprano voice with a larger-than-life sense of style and timing for an overall sound that is personably unique and heart-stoppingly memorable. Of course, it is impossible to capture the essence of any musical artist with words, and this is especially true with this release, Johnson's second (and the first for her own, new Mojave Sun Records). The best way to go about it may be to argue that her cover of "Georgia On My Mind" is as evocative a piece of singing (backed only by fellow San Diegan Wade Preston on piano) as one is likely to hear this side of Ray Charles. While Johnson's voice is so beautiful as to compare sensually with eating double-chocolate fudge mousse, so lovely that we would gladly listen to her sing The Osmonds' greatest hits, she is equally remarkable as a composer. Outside the above-mentioned "Georgia On My Mind," she wrote every song on this album. While there isn't a dog in the bunch, especially noteworty are "Daddy Can I Be a Cowboy," "I Can Only Hold You With My Eyes" and the title track.